2012 PROSE Award, Clinical Medicine: Honorable Mention The vast majority of medically important pathogens infect their host across a body surface such as the skin, or across a mucosal tissue such as the respiratory tract or intestines, as these sites are the ones exposed to the external environment. By focusing on immunity at mucosal and body surfaces this book presents a fresh, new approach to the teaching of immunology. After an introduction to the basic structure of the immune system, the book looks at two important families of signalling molecules: cytokines and chemokines, before covering the workings of the mucosal immune system. It continues by examining immunity against the four major groups of pathogens - viruses, bacteria, fungi and parasites, and concludes by looking at disorders of the immune system, mucosal tumour immunology and the process of vaccination. * A fresh, new approach to the subject focusing on mucosal and body surfaces. * Describes the mucosal immune systems of the gastrointestinal, respiratory and urogenital tracts, as well as the skin. * Details the important roles of cytokines and chemokines in an immune response. * Separate chapters devoted to immunity against viruses, bacteria, fungi and parasites. * Includes chapter summaries, boxes with topics of special interest and an extensive glossary. * Clearly written and well- illustrated in full colour throughout. 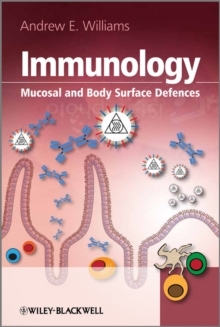 Students across a range of disciplines, including biology, biochemistry, biomedicine, medicine and veterinary sciences, will find this book invaluable, both as an introduction to basic immunology and as a guide to mucosal immune defence mechanisms.